I should subtitle this "It's not Charles Phan's fault that my shrimp don't look like his." You know what it's like when you get a cookbook that everyone's ooh-ing and ahh-ing about and you're really anxious to try a recipe? So then you paw through the book until you find a recipe you can make right now? And then you run to the kitchen like a toddler with a sugar high and start slicing and dicing and chopping and frying? 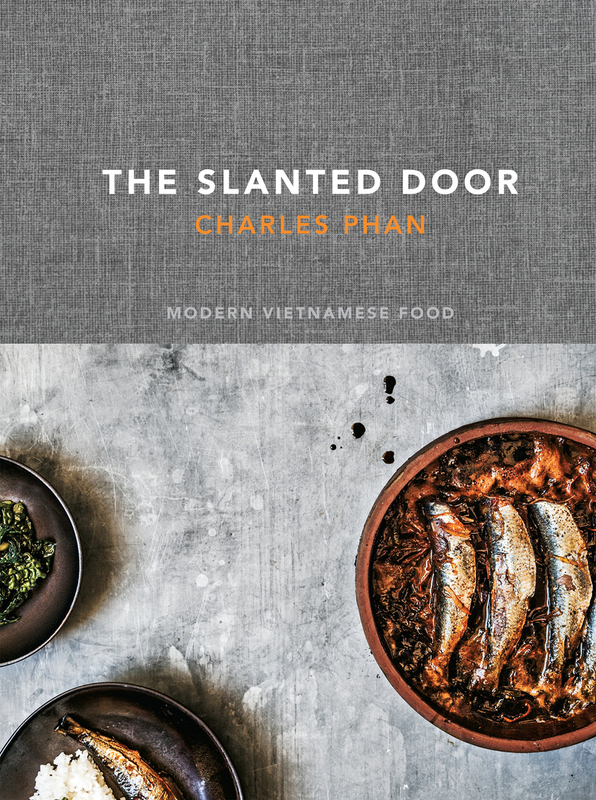 Yup, that's what I did when I got my review copy of The Slanted Door by Charles Phan. In my excitement, I screwed up on some of the procedures. The sad thing is that the instructions were perfectly clear, and there was absolutely nothing complicated about what I needed to do. Anyone could have followed the recipe, except me, because I was too excited and I jumped a couple steps ahead of where I was supposed to be. The crazy thing is that even though I messed up, and then I had to compensate for messing up by changing something else, the recipe still tasted good. It wasn't exactly what it was supposed to be, but no one would ever know. And that's a big deal. There are way too many recipes where if you waver just a little bit, the whole thing goes off kilter. I hate when that happens. I know that these days, photos are a big deal in cookbooks, and this one has some great photos. Not stunning in the sense that you'd go "wow, that's a pretty, artistic, stunning photo that I'd want to frame!" but more like, "wow, I want to eat that." Even the food in the photos isn't perfect. Everything isn't identically browned. Placement isn't precise. Knots on cabbage rolls aren't all the same. But that's fine. It's a subtle hint that if I make this at home, it's going to be fine if I do things slightly differently. Since this is a Vietnamese cookbook, I expected there would be some ingredients I'd have a hard time finding, so I was pleasantly surprised that most of the recipes didn't require a dictionary and online purchases. Most of the items can be found at a well-stocked grocery store, or could be substituted. I'm looking at a recipe right now for vegetarian imperial rolls, and the two items that might be harder to find are taro and dried tree-ear mushrooms. For the taro, I might use parnsips or potatoes. And for the dried mushrooms - well, I'm sure I could find some other dried mushroom. The next-most exotic items are cellophane noodles and rice paper, and I'm pretty sure I can find both of them at one of the local grocery stores.And everything else is really simple, like carrots, cabbage, and honey. Besides food, there are cocktail recipes that look like a whole lot of fun. So ... now I know why everyone was so giddy about this book. I'm going to have a lot of fun with it. I received this book at no cost to me for the purpose of a review.